It's Fictional Friday again! In this series on my blog, I'm presenting fantastical and fictional architecture from television, literature, films, computer games etc. 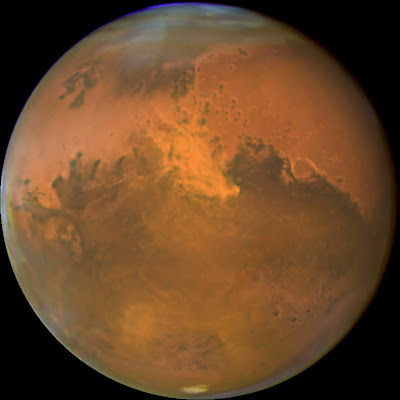 Today's post is a special kind of approach to fictional architecture: A science fiction short story by A. E. van Vogt about a strange marble village on the planet Mars. "Explorers of a new frontier” they had been called before they left for Mars. For a while, after the ship crashed into a Martian desert, killing all on board except—miraculously—this one man, Bill Jenner spat the words occasionally into the constant, sand-laden wind. He despised himself for the pride he had felt when he first heard them. His fury faded with each mile that he walked, and his black grief for his friends became a gray ache. Slowly he realized that he had made a ruinous misjudgment.lie had underestimated the speed at which the rocketship had been traveling. He’d guessed that he would have to walk three hundred miles to reach the shallow, polar sea be and the others had observed as they glided in from outer space. Actually, the ship must have Bashed an immensely greater distance before it hurtled down out of control. The days stretched behind him, seemingly as numberless as the hot, red, alien sand that scorched through his tattered clothes. A huge scarecrow of a man, he kept moving across the endless, arid waste— he would not give up. By the time he came to the mountain, his food had long been gone. Of his four water bags, only one remained, and that was so close to being empty that he merely wet his cracked lips and swollen tongue whenever his thirst became unbearable. Jenner climbed high before he realized that it was not just another dune that had barred his way. He paused, and as he gazed up at the mountain that towered above him, he cringed a little. For an instant he felt the hopelessness of this mad race he was making to nowhere—but he reached the top. He saw that below him was a depression surrounded by hills as high as, or higher than, the one on which he stood. Nestled in the valley they made was a village. He could see trees and the marble Boor of a courtyard. A score of buildings was clustered around what seemed to be a central square. They were mostly low-constructed, but there were four towers pointing gracefully into the sky. They shone in the sunlight with a marble luster. Faintly, there came to Jenner’s cars a thin, high- pitched whistling sound. It rose, fell, faded completely, then came up again clearly and unpleasantly. Fven as Jenner ran toward it, the noise grated on his ears, eerie and unnatural. He kept slipping on smooth rock, and bruised himself when he fell. He rolled halfway down into the valley. The buildings remained new and bright when seen from nearby. Their walls Bashed with reBeetions. On every side was vegetation— reddish-green shrubbery, yellow- green trees laden with purple and red fruit. had been warned during his training period to taste nothing on Mars until it had been chemically examined. But that was meaningless advice to a man whose only chemical equipment was in his own body. Nevertheless, the possibility of danger made him cautious. He took his first bite gingerly. It was bitter to his tongue, and he spat it out hastily. Some of the juice which remained in his mouth seared his gums. He felt the fire on it, and he reeled from nausea. His muscles began to jerk, and he lay down on the marble to keep himself from falling. After what seemed like hours to Jenner, the awful trembling finally went out of his body and he could see again. He looked up despisingly at the tree. The pain finally left him, and slowly he relaxed. A soft breeze rustled the dry leaves. Nearby trees took up that gentle clamor, and it struck Jenner that the wind here in the valley was only a whisper of what it had been on the Bat desert beyond the mountain. There was no other sound now. Jenner abruptly remembered the high-pitched, ever-changing whistle he had heard. He lay very still, listening intently, but there was only the rustling of the leaves. The noisy shrilling had stopped. lie wondered if it had been an alarm, to warn the villagers of his approach. Anxiously he climbed to his feet and fumbled for his gun. A sense of disaster shocked through him. It wasn’t there. His mind was a blank, and then he vaguely recalled that he had first missed the weapon more than a week before. I-Ic looked around him uneasily, but there was not a sign of creature life. He braced himself. He couldn’t leave, as there was nowhere to go. If necessary, he would fight to the death to remain in the village. Carefully Jenner took a sip from his water bag, moistening his cracked lips and his swollen tongue. Then he replaced the cap and started through a double line of trees toward the nearest building. He made a wide circle to observe it from several vantage points. On one side a low, broad archway opened into the interior. Through it, he could dimly make out the polished gleam of a marble floor. Jenner explored the buildings from the outside, always keeping a respectful distance between him and any of the entrances. He saw no sign of animal life. He reached the far side of the marble platform on which the village was built, and turned back decisively. It was time to explore interiors. He chose one of the four tower buildings. As he came within a dozen feet of it, he saw that he would have to stoop low to get inside. Momentarily, the implications of that stopped him. These buildings had been constructed for a life form that must be very different from human beings. He went forward again, bent down, and entered reluctantly, every muscle tensed. He found himself in a room without furniture. However, there were several low marble fences projecting from one marble wall. They formed what looked like a group of four wide, low stalls. Each stall had an open trough carved out of the floor. The second chamber was fitted with four inclined planes of marble, each of which slanted up to a dais. Altogether there were four rooms on the lower floor. Froi-n one of them a circular ramp mounted up, apparently to a tower room. J enner didn’t investigate the upstairs. The earlier fear that he would find alien life was yielding to the deadly conviction that he wouldn’t. No life meant no food or chance of getting any. In frantic haste he hurried from building to building, peering into the silent rooms, pausing now and then to shout hoarsely. Finally there was no doubt. He was alone in a deserted village on a lifeless planet, without food, without water—except for the pitiful supply in his bag— and without hope. He was in the fourth and smallest room of one of the tower buildings when he realized that he had come to the end of his search. The room had a single stall jutting out from one wall. Jenner lay down wearily in it. He must have fallen asleep instantly. When he awoke he became aware of two things, one right after the other. The first realization occurred before he opened his eyes—the whistling sound was back; high and shrill, it wavered at the threshold of audibility. The other was that a fine spray of liquid was being directed down at him from the ceiling. It had an odor, of which technician Jenner took a single whiff. Quickly he scrambled out of the room, coughing, tears in his eyes, his face already burning froin chemical reaction. He snatched his handkerchief and hastily wiped the exposed parts of his body and face. He reached the outside and there paused, striving to understand what had happened. The village seemed unchanged. Leaves trembled in a gentle breeze. The sun was poised on a mountain peak. J enner guessed from its position that it was morning again and that he had slept at least a dozen hours. The glaring white light suffused the valley. Half hidden by trees and shrubbery, the buildings Bashed and shimmered. He seemed to be in an oasis in a vast desert. It was an oasis, all right, Jenner reflected grimly, but not for a human being. For him, with its poisonous fruit, it was more like a tantalizing mirage. He went back inside the building and cautiously peered into the room where he had slept. The spray of gas had stopped, not a bit of odor lingered, and the air was fresh and clean. He edged over the threshold, half inclined to make a test. He had a picture in his mind of a long-dead Martian creature lazing on the floor in the stall while a soothing chemical sprayed down on its body. The fact that the chemical was deadly to human beings merely emphasized how alien to man was the life that had spawned on Mars. But there seemed little doubt of the reason for the gas. The creature was accustomed to taking a morning shower. may be others.” Breathing heavily, he raced into the outer room. Carefully he shoved his legs into one of the two stalls. The moment his hips were in, a steaming gruel filled the trough beside the wall. He stared at the greasy-looking stuff with a horrified fascination—food—and drink. He remembered the poison fruit and felt repelled, but he forced himself to bend down and put his finger into the hot, wet substance. He brought it up, dripping, to his mouth. It tasted flat and pulpy, like boiled wood fiber. It trickled viscously into his throat. His eyes began to water and his lips drew back convulsively. He realized he was going to be sick, and ran for the outer door— but didn’t quite make it. When he finally got outside, he felt limp and unutterably listless. In that depressed state of mind, he grew aware again of the shrill sound. He felt amazed that he could have ignored its rasping even for a few minutes. Sharply he glanced about, trying to determine its source, but it seemed to have none. Whenever he approached a point whereit appeared to be loudest, then it would fade or shift, perhaps to the far side of the village. He tried to imagine what an alien culture would want with a mind-shattering noise—although, of course, it would not necessarily have been unpleasant to them. He stopped and snapped his fingers as a wild but nevertheless plausible notion entered his mind. Could this be music? He toyed with the idea, trying to visualize the village as it had been long ago. Here a music-loving people had possibly gone about their daily tasks to the accompaniment of what was to them beautiful strains of melody. The hideous whistling went on and on, waxing and waning. Jenner tried to put buildings between himself and the sound. He sought refuge in various rooms, hoping that at least one would be soundproof. None were. The whistle followed him wherever he went. The scene that spread before him had in it qualities of both heaven and hell. It was all too familiar now—the red sands, the stony dunes, the small, alien village promising so much and fulfilling so little. Jenner looked down at it with his feverish eyes and ran his parched tongue over his cracked, dry lips. He knew that he was a dead man unless he could alter the automatic food-making machines that must be hidden somewhere in the walls and under the Boors of the buildings. survived here in this village. The inhabitants had died off, but the village lived on, keeping itself clean of sand, able to provide refuge for any Martian who might come along. But there were no Martians. There was only Bill Jenner, pilot of the first roeketship ever to land on Mars. He had to make the village turn out food and drink that he could take. Without tools, except his hands, with scarcely any knowledge of chemistry, he must force it to change its habits. Tensely he hefted his water bag. He took another sip and fought the same grim fight to prevent himself from guzzling it down to the last drop. And, when he had won the battle once more, he stood up and started down the slope. He could last, he estimated, not more than three days. In that time he must conquer the village. He was already among the trees when it suddenly struck him that the “music” had stopped. Relieved, he bent over a small shrub, took a good firm hold of it— and pulled. It came up easily, and there was a slab of marble attached to it. Jenner stared at it, noting with surprise that he had been mistaken in thinking the stalk came up through a hole in the marble. It was merely stuck to the surface. Then he noticed something else—the shrub had no roots. Almost instinctively, Jenner looked down at the spot from which he had torn the slab of marble along with the plant. There was sand there. He dropped the shrub, slipped to his knees, and plunged his fingers into the sand. Loose sand trickled through them. He reached deep, using all his strength to force his arm and hand down; sand—nothing but sand. He stood up and frantically tore up another shrub. It also came up easily, bringing with it a slab of marble. It had no roots, and where it had been was sand. With a kind of mindless disbelief, Jenner rushed over to a fruit tree and shoved at it. There was a momentary resistance, and then the marble on which it stood split and lifted slowly into the air. The tree fell over with a swish and a crackle as its dry branches and leaves broke and crumbled into a thousand pieces. Un- derneath where it had been was sand. Sand everywhere. A city built on sand. Mars, planet of sand. That was not completely true, of course. Seasonal vegetation had been observed near the polar ice caps. All but the hardiest of it died with the coming Of summer. It had been intended that the rocketship land near one of those shallow, tideless seas. By coming down out of control, the ship had wrecked more than itself. It had wrecked the chances for life of the only survivor of the voyage. enner came slowly out of his daze. He had a thought then. He picked up one of the shrubs he had already torn loose, braced his foot against the marble to which it was attached, and tugged, gently at first, then with increasing strength. It came loose finally, but there was no doubt that the two were part of a whole. The shrub was growing out of the marble. section. It was quite porous—calciferous rock, most likely, but not true marble at all. As he reached toward it, intending to break off a piece, it changed color. Astounded, Jenner drew back. Around the break, the stone was turning a bright orange-yellow. He studied it uncertainly, then tentatively he touched it. It was as if he had dipped his fingers into searing acid. There was a sharp, biting, burning pain. With a gasp, Jenner jerked his hand clear. The continuing anguish made him feel faint.He swayed and moaned, clutching the bruised members to his body. When the agony finally faded and he could look at the injury, he saw that the skin had peeled and that blood blisters had formed already. Grimly Jenner looked down at the break in the stone. The edges remained bright orange-yellow. The village was alert, ready to defend itself from further attacks. Suddenly weary, he crawled into the shade of a tree. There was only one possible conclusion to draw from what had happened, and it almost defied common sense. This lonely village was alive. As he lay there, Jenner tried to imagine a great mass of living substance growing into the shape of buildings, adjusting itself to suit another life form, accepting the role of servant in the widest meaning of the term. If it would serve one race, why not another? If it could adjust to Martians, why not to human beings? thousands of compounds could be made from sand.. . . Though it meant death if he failed to find a solution, he fell asleep even as he started to think about what they might be. When he awoke it was quite dark. Jenner climbed heavily to his feet. There was a drag to his muscles that alarmed him. He wet his mouth from his water bag and staggered toward the entrance of the nearest building. Except for the scraping of his shoes on the “marble,” the silence was intense. He stopped short, listened, and looked. The wind had died away. He couldn’t see the mountains that rimmed the valley, but the buildings were still dimly visible, black shadows in a shadow world. For the first time, it seemed to him that, in spite of his new hope, it might be better if he died. Even if he survived, what had he to look forward to? Only too well he recalled how hard it had been to rouse interest in the trip and to raise the large amount of money required. He remembered the colossal problems that had had to be solved in building the ship, and some of the men who had solved them were buried somewhere in the Martian desert. It might be twenty years before another ship from Earth would try to reach the only other planet in the Solar System that had shown signs of being able to support life. have grasped that it had a new tenant. How could he make it realize he needed food in a different chemical combination than that which it had served in the past; that he liked music, but on a different scale system; and that he could use a shower each morning—of water, not of poison gas? He dozed fitfully, like a man who is sick rather than sleepy. Twice he wakened, his lips on fire, his eyes burning, his body bathed in perspiration. Several times he was startled into consciousness by the sound of his own harsh voice crying out in anger and fear at the night. He guessed, then, that he was dying. He spent the long hours of darkness tossing, turning, twisting, befuddled by waves of heat. As the light of morning came, he was vaguely surprised to realize that he was still alive. Restlessly he climbed off the dais and went to the door. A bitingly cold wind blew, but it felt good to his hot face. He wondered if there were enough pneumococci in his blood for him to catch pneumonia. He decided not. In a few moments he was shivering. He retreated back into the house, and for the first time noticed that, despite the doorless doorway, the wind did not come into the building at all. The rooms were cold but not draughty. That started an association: Where had his terrible body heat come from? He teetered over to the dais where he spent the night. Within seconds he was sweltering in a temperature of about one hundred and thirty. He climbed off the dais, shaken by his own stupidity. lie estimated that he had sweated at least two quarts of moisture out of his dried-up body on that furnace of a bed. This village was not for human beings. Here even the beds were heated for creatures who needed temperatures far beyond the heat comfortable for men. Jenner spent most of the day in the shade of a large tree. He felt exhausted, and only occasionally did he even remember that he had a problem. \Vhen the whistling started, it bothered him at first, but he was too tired to move away from it. There were long periods when he hardly heard it, so dulled were his senses. Late in the afternoon he remembered the shrubs and the trees he had torn up the day before and wondered what had happened to them. He wet his swollen tongue with the last few drops of water in his bag, climbed lackadaisically to his feet, and went to look for the dried-up remains. That galvanized Jenner. He began to think again . . . about mutations, genetic readjustrnents, life forms adapting to new environments. There’d been lectures on that before the ship left Earth, rather generalized talks designed to acquaint the explorers with the problems men might face on an alien planet. The im- portant principle was quite simple: adjust or die. The village had to adjust to him. He doubted if he could seriously damage it, but he could try. His own need to survive must be placed on as sharp and hostile a basis as that. Frantically Jenner began to search his pockets. Before leaving the rocket he had loaded himself with odds and ends of small equipment. A jackknife, a folding metal cup, a printed radio, a tiny superbattery that could be charged by spinning an attached wheel—and for which he had brought along, among other things, a powerful electric fire lighter. Jenner plugged the lighter into the battery and deliberately scraped the red-hot end along the surface of the “marble.” The reaction was swift. The substance turned an angry purple this time. When an entire section of the Boor had changed color, Jenner headed for the nearest stall trough, entering far enough to activate it. There was a noticeable delay. When the food finally Bowed into the trough, it was clear that the living village had realized the reason for what he had done. The food was a pale, creamy color, where earlier it had been a murky gray. Jenner put his finger into it but withdrew it with a yell and wiped his finger. It continued to sting for several moments. The vital question was: Had it deliberately offered him food that would damage him, or was it trying to appease him without knowing what he could eat? He decided to give it another chance, and entered the adjoining stall. The gritty stuff that flooded up this time was yellower. It didn’t burn his finger, but Jenner took one taste and spat it out. He had the feeling that he had been offered a soup made of a greasy mixture of clay and gasoline. He was thirsty now with a need heightened by the unpleasant taste in his mouth. Desperately he rushed outside and tore open the water bag, seeking the wetness inside. In his fumbling eagerness, he spilled a few precious drops onto the courtyard. Down he went on his face and licked them up. Half a minute later, he was still licking, and there was still water. The fact penetrated suddenly. lie raised himself and gazed wonderingly at the droplets of water that sparkled on the smooth stone. As he watched, another one squeezed up from the apparently solid surface and shimmered in the light of the sinking sun. He bent, and with the tip of his tongue sponged up each visible drop. For a long time he lay with his mouth pressed to the “marble,” sucking up the tiny bits of water that the village doled out to him. The glowing white sun disappeared behind a hill. Night fell, like the dropping of a black screen. The air turned cold, then icy. lie shivered as the wind keened through his ragged clothes. But what finally stopped him was the collapse of the surface from which he had been drinking. of the village to please him, but there was another, less satisfying, implication. If the village had to destroy a part of itself every time it gave him a drink, then clearly the supply was not unlimited. Jenner hurried inside the nearest building, climbed onto a dais—and climbed off again hastily, as the heat blazed up at him. He waited, to give the Intelligence a chance to realize he wanted a change, then lay down once more. The heat was as great as ever. Fle gave that up because he was too tired to persist and too sleepy to think of a method that might let the village know he needed adifferent bedroom temperature. He slept on the Boor with an uneasy conviction that it could not sustain him for long. He woke up many times during the night and thought, “Not enough water. No matter how hard it tries—” Then he would sleep again, only to wake once more, tense and unhappy. Nevertheless, morning found him briefly alert; and all his steely determination was back—that iron will power that had brought him at least five hundred miles across an unknown desert. He headed for the nearest trough. This time, after he had activated it, there was a pause of more than a minute; and then about a thimbleful of water made a wet splotch at the bottom. Jenner licked it dry, then waited hopefully for more. When none came he reflected gloomily that somewhere in the village an entire group of cells had broken down and released their water for him. Then and there he decided that it was up to the human being, who could move around, to find a new source of water for the village, which could not move. In the interim, of course, the village would have to keep him alive, until he had investigated the possibilities. That meant, above everything else, he must have some food to sustain him while he looked around. He began to search his pockets. Toward the end of his foodsupply, he had carried scraps and pieces wrapped in small bits of cloth. Crumbs had broken off into the pocket, and he had searched for them often during those long days in the desert. Now, by actually ripping the seams, he discovered tiny particles of meat and bread, little bits of grease and other unidentifiable substances. Carefully he leaned over the adjoining stall and placed the scrapings in the trough there. The village would not be able to offer him more than a reasonable facsimile. If the spilling of a few drops on the courtyard could make it aware of his need for water, then a similar offering might give it the clue it needed as to the chemical nature of the food he could eat. Jenner waited, then entered the second stall and activated it. About a pint of thick, creamy substance trickled into the bottom of the trough. The smallness of the quantity seemed evidence that perhaps it contained water. He tasted it. It had a sharp, musty flavor and a stale odor. It was almost as dry as flour—but his stomach did not reject it. could never be sure that one of the food ingredients was not a slow-acting poison. When he had finished the meal he went to a food trough in another building. He refused to eat the food that came up, but activated still another trough. This time he received a few drops of water. He had come purposefully to one of the tower buildings. Now he started up the ramp that led to the upper Boor. Fle paused only briefly in the room he came to, as he had already discovered that they seemed to be additional bedrooms. The familiar dais was there in a group of three. climb before. Now he looked out to every horizon. Almost immediately the hope that had brought him up faded. The view was immeasurably desolate. As far as he could see was an arid waste, and every horizon was hidden in a mist of wind-blown sand. Jenner gazed with a sense of despair. If there were a Martian sea out there somewhere, it was beyond his reach. Abruptly he clenched his hands in anger against his fate, which seemed inevitable now. At the very worst, he had hoped he would find himself in a mountainous region. Seas and mountains were generally the two main sources of water. He should have known, of course, that there were very few mountains on Mars. It would have been a wild coincidence if he had actually run into a mountain range. His fury faded because he lacked the strength to sustain any emotion. Numbly he went down the ramp. His vague plan to help the village ended as swiftly and finally as that. The days drifted by, but as to how many he had no idea. Each time he went to eat, a smaller amount of water was doled out to him. Jenner kept telling himself that each meal would have to be his last. It was unreasonable for him to expect the village to destroy itself when his fate was certain now. What was worse, it became increasingly clear that the food was not good for him. He had misled the village as to his needs by giving it stale, perhaps even tainted, samples, and prolonged the agony for himself. At times after he had eaten, Jenner felt dizzy for hours. All too frequently his head ached and his body shivered with fever. The village was doing what it could. The rest was up to him, and he couldn’t even adjust to an approximation of Earth food. For two days he was too sick to drag himself to one of the troughs. Hour after hour he lay on the floor. Some time during the second night the pain in his body grew so terrible that he finally made up his mind. The hallucination was so complete that momentarily he seemed to be back in the control room of the rocketship, and all around him were his former com- panions. With a sigh of relief Jenner sank into a dreamless sleep. He woke to the sound of a violin. It was a sad-sweet music that told of the rise and fall of a race long dead. Jenner listened for a while and then, with abrupt excitement, realized the truth. This was a substitute for the whistling—the village had adjusted its music to him! Other sensory phenomena stole in upon him. The dais felt comfortably warm, not hot at all. He had a feeling of wonderful physical well-being. Eagerly he scrambled down the ramp to the nearest food stall. As he crawled forward, his nose close to the floor, the trough filled with a steamy mixture. The odor was so rich and pleasant that he plunged his face into it and slopped it up greedily. It had the flavor of thick, meaty soup and was warm and soothing to his lips and mouth. When he had eaten it all, for the first time he did not need a drink of water. After a while he remembered something and crawled to the bathroom. Cautiously, watching the ceiling, he eased himself backward into the shower stall. The yellowish spray came down, cool and delightful. Ecstatically Jenner wriggled his four-foot-tail and lifted his long snout to let the thin streams of liquid wash away the food impurities that clung to his sharp teeth. Now, what sort of architecture did you imagine reading this?